Back to Yanhuitlán, in colonial times, Yanhuitlán was an important commercial center of the Mixtec people, exporting silk to Mexico City, Puebla, and Oaxaca city. Now the town has a couple thousand inhabitants. 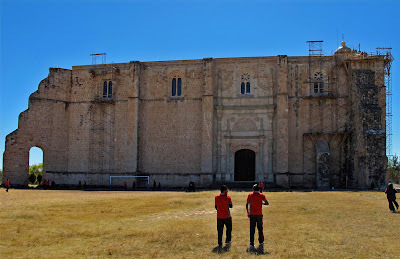 It’s main attraction is the Templo y Ex-Convento de Santo Domingo de Guzmán which is larger than the Santo Domingo in Oaxaca. The church started by Fray Domingo de la Cruz in 1541 and was built on top of a Mixtec temple. At the same time the San Pedro y San Pablo was built in Teposcolula by Friar Pedro Peña. The size of these temples and convents in what are now such small towns speaks volumes as to the impact of the Spanish conquistadors and the church on the native populations. Within 50 years of the completion the population that the Dominicans were supposedly saving had collapsed. 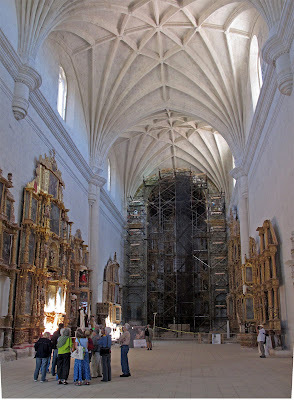 The Santo Domingo has a wide and high nave, which closes with ribbed vault, measuring 75 m long, 15 meters wide and 25 meters high. The prize here though is the main rotablo or alter piece. The main retable, in a baroque style, is absolutely magnificent. It is believed to have been the work of the famous artist Andres de la Concha and carried out between the years 1575 to 1612. It has four sections, divided by seven entrecalles and the pediment. The seven entrecalles house sculptures and oil paintings. The latter include depictions of Christ being crucified, the Resurrection, the Purisima, Magdalena Penitente, the Anunciacion, the Adoration of the Kings, the Assumption of the Lord, and the Virgin of the Rosary. Restoration is ongoing for the church, convent, and alter piece. In 1550, the construction of the convent was already in process. At present, the ex convent functions as a museum under the charge of the Institute of Anthropology and History. For a few more fotos go to my picasa web album.